The United States is officially now among the deadliest countries for journalists, according to an annual report now out from Reporters Without Borders. The U.S. ranked among the most lethal countries for journalists, behind Afghanistan, Syria, Mexico, Yemen and India, in that order. This is the first time the U.S. has appeared on the list. Afghanistan was perhaps predictably the world’s deadliest country for journalists in 2018, when 15 were killed. It was followed by Syria (11 killed) and Mexico (nine killed) and six journalists were killed in the U.S — hence the placement on the list. But if we look a bit deeper, this is because of the fatal shooting of five employees of the Capital Gazette, a newspaper in Annapolis, Maryland. Jarrod Ramos had harassed the newspaper for six years on Twitter about an article in 2011 that named him before hewalked into the paper’s newsroom and opened fire with a shotgun in June. Yes, five were killed by Ramos, a disgruntled reader. NOTE: Not to diminish the horrible deaths, but only four were active journalists, the other a sales rep. The other death was independent music journalist Zachary Stoner, who was shot to death in the early hours of May 30 in Chicago, Illinois in a drive-by shooting. Fake news is the likening the conditions for journalists in Afghanistan to America. “The hatred of journalists that is voiced… by unscrupulous politicians, religious leaders and businessmen has tragic consequences on the ground, and has been reflected in this disturbing increase in violations against journalists,” RSF secretary-general Christophe Deloire said in a statement. Sure, but in the Middle East they are victims of terrorist attacks, killed in the line of duty, in the field – hardly the case in America. Threats against journalists in America have also been on the rise as Donald Trump repeatedly and falsely accuses the entire industry of lying about his administration. He’s continued to insist on referring to reporters with rhetoric lifted from dictatorships, even after the deadly shooting at the Capital Gazette. America is on the list “largely” due to the Gazette shooting, but it’s Trump’s fault. No, it’s entirely due to the Gazette shooting, which had NOTHING to do with POLITICS or TRUMP. The only problem is that TRUMP has NOTHING to do with this violence. 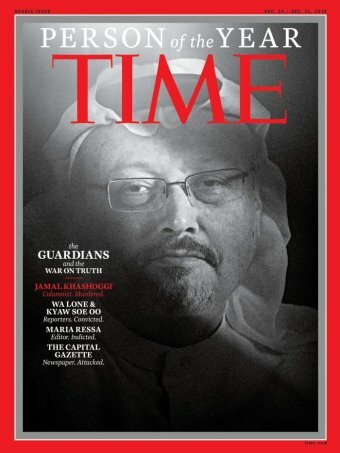 It’s disgusting to attack Trump, compare conditions and the deaths of journalists like Washington Post columnist Jamal Khashoggi to the mass shooting deaths of those at the Gazette. Thanks to GQ and other outlets like the TIMES, for reminding us what FAKE NEWS looks like.